Hello! My name is Victoria A. Moran, and I am the one wearing this handmade The Ring costume I put together myself. 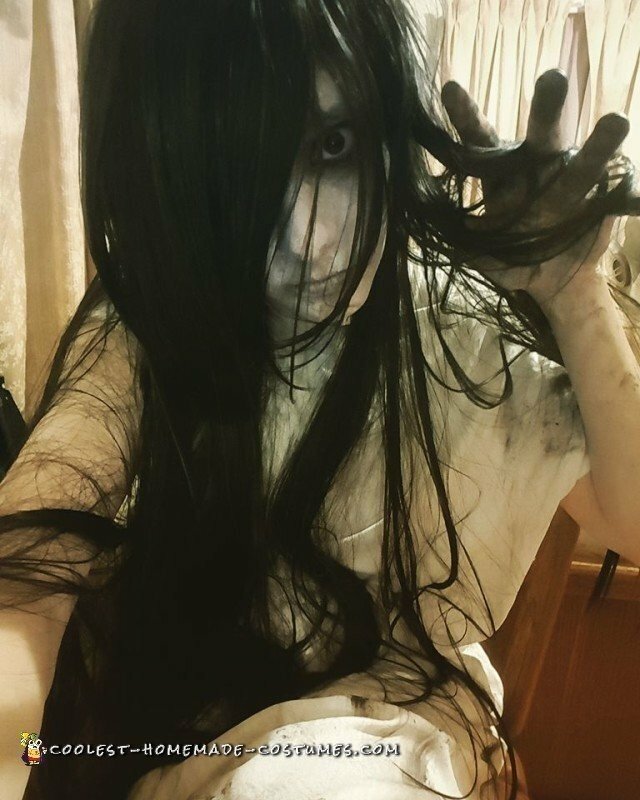 After hearing about a local costume party last Halloween from a family member, I decided to finally dress-up as one of my favorite antagonists from one of my favorite horror films, The Ring! I had tons of fun at the party, and I sure turned quite of few heads with my arrival, haha! Quite a few people were genuinely afraid of me. That in itself felt pretty awesome. 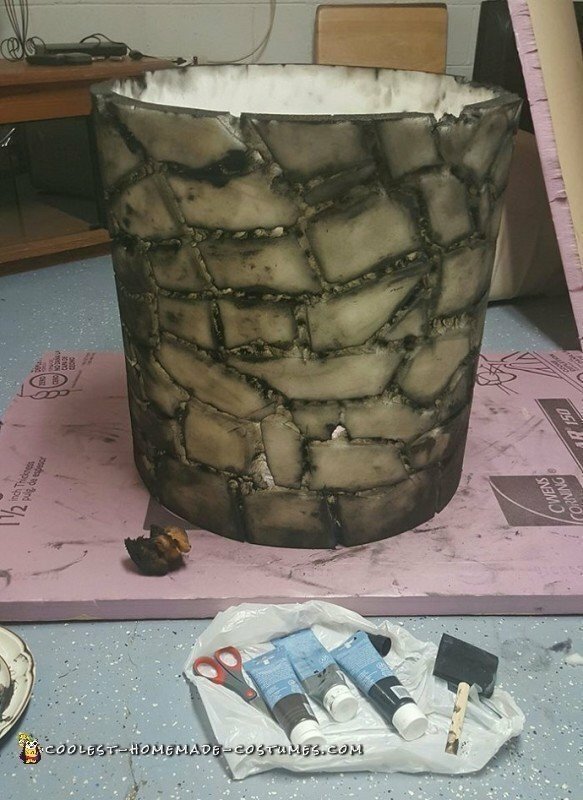 I have included a couple in-costume photos, as well as a couple progress photos of the well prop I made. To be honest, I actually made this well prop on a whim with just a couple days before the event, so this was my first time making the prop without any sort of tutorial, so I apologize if the supplies are not exact and I am open to suggestions for revising the production process! I am in no words a professional costume maker, just a big fan of horror and all things Halloween! First, here’s a little run-down on how I put the well part of The Ring costume together. – one 3 in. thick multi-purpose foam fabric, 24 in. x 76 in. – a sheet of black fabric (any type will do), 24 in. x 76 in. 1. First, take your foam fabric and lay it out, and place your measured out black fabric on top (you want to make sure the fabric measurements match the foam fabric!). Take your fabric glue and start gluing the sheet of black fabric as a top layer to your foam fabric sheet. Take the ends of the foam and glue them together at the 3 in. cuts, so that you create a well shape. You should let the glue set for at least an hour before your next step. 2. Next, take your black chalk or marker and start loosely drawing out the stone well design onto your foam well based off of the stone well picture. 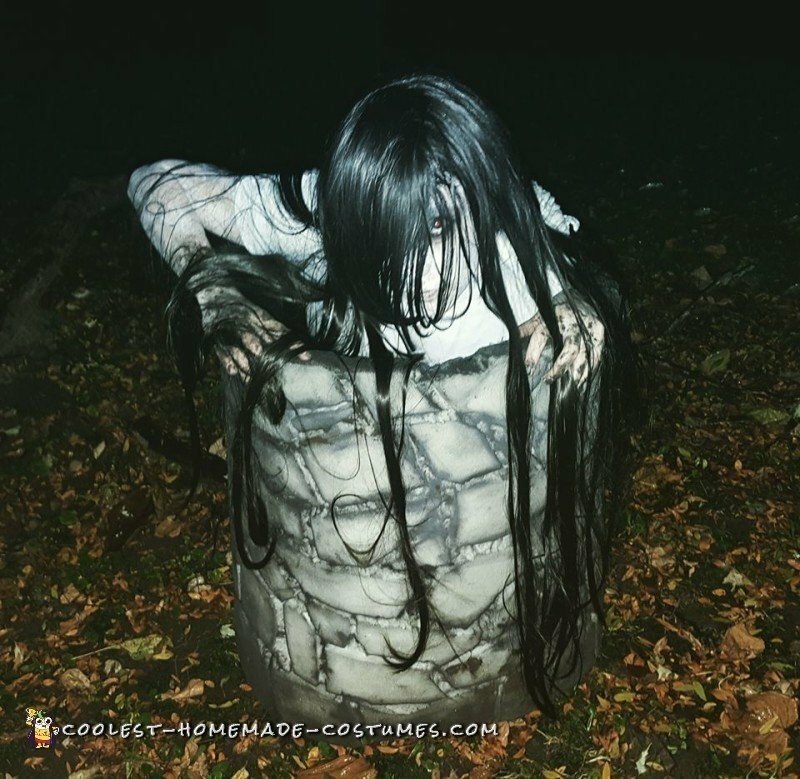 I wanted to emulate the well from The Ring as much as possible, so I chose a picture of that one from the movie as my reference(the American adaption). You don’t want to be perfect with this, the idea is to look rough and unpolished. This isn’t your mother’s garden edging, this is a decrepit well in the middle of the woods! The more uneven and ugly your design is, the creepier! 3. Once you have the basic lines sketched out, you want to start carving into your foam well with the X-acto knife or preferred carving tool. 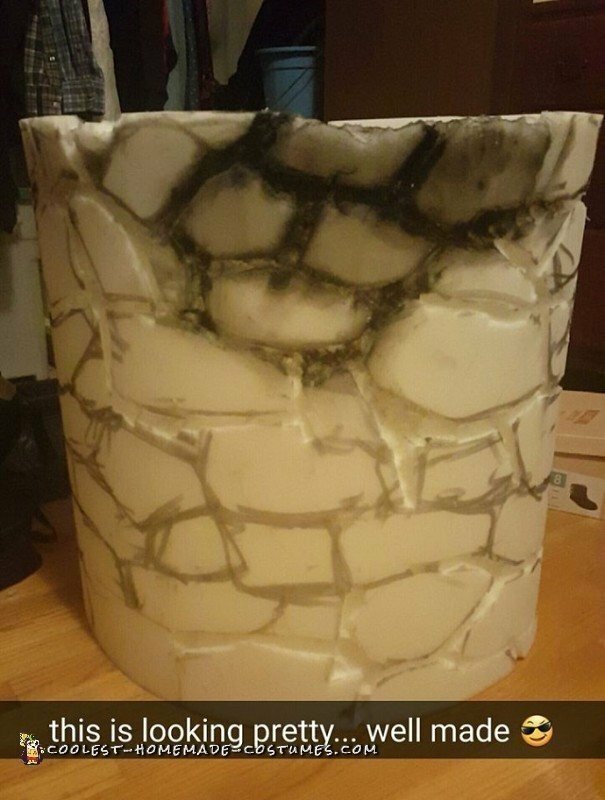 Start from the top and work your way down and around the entire well, slicing/carving along your sketched lines, be very careful of not cutting to deep that you end up cutting a hole all the way through your foam and black fabric! Again, you want to just hack away at the foam to create a rustic appearance, loosely following the lines, the cuts will be more deep or more shallow than the rest. When I made my cuts, I even used my hands to carefully rip out the fabric, which also made a nice rough texture. Don’t forget to do this to the very top edge of the well, you don’t want to leave in perfectly smooth. 4. Here’s the most fun part in my opinion, painting! Take you paints and squeeze a nice amount of each color onto your paper plate. Take your brush and start with the grey paint, and paint the entire outside surface of your well. Next, dip the brush into your black paint and start painting into the carvings of your well. This will make your stone shapes really pop, especially if you blend the black around the edges of each “stone”. This is a time to take your painting sponges and start creating messy texture onto your well. Dip your sponge into some of the umber paint and rub roughly around the base and top of the well to create a dirty, old look. Keep messing with your paints until you finish creating the look you want. 5. Now, after you’ve let your paint dry completely (I let mine sit overnight since the paint soaks into the foam), you want to start patching together your interior holster. This is what will go inside your well and tie around your waist like a belt, so instead of having to hold up your prop by hand as you walk around, it will sit around your waist hands-free! Take your extra black fabric and measure out a strip that in the length of the circumference of your well, which is approximately 76 in., and about 3 in. in width. Set aside this strip. Now take a loose measurement of your waistline plus a couple inches and cut that into another black strip, 3 in. in width. Attach the velcro pieces to each end of this strip so that you have made a makeshift belt. If you want to be extra, you can sew the velcro into the fabric to make it more permanent. Next, take the measurement between the well and your waist from the inside, and cut out 4 more strips of black fabric. Fabric glue the 4 strips onto the 76 in. strip of black fabric so that each strip is spaced evenly. Then glue the ends of each of the 4 strips onto the black strip that is the length of your waistline measurement. Secure this makeshift harness to the interior of the well with fabric glue, so that when you wear the inside harness around your waist the well will hover around you, with the top of the well meeting your center of your chest. Adjust the velcro so that you can wear the well comfortably. Next, I will go over the rest of The Ring costume for Samara! – Black eyeliner and eye shadow. – A long, white gown. 1. First, put on your leggings and white gown and shoes on. I like to do this first because as your applying your makeup, you kind of want to make a mess on your clothes. Feel free to wipe your hands on your gown, leggings, even shoes as much as you want. Because this will make you look as if you just crawled out of a gross well! 2. To apply the makeup, start by rubbing an even layer of white face/body paint all over your face, down your neck, and along your arms. Any skin that is showing you want to cover up, this is how you will look convincingly dead. If your makeup starts peeling, this is good because it looks even creepier this way. You want you skin to have a sickeningly pale, uneven complexion. 3. Next, take your black eyeliner and apply it around the edge of your eyes. To make this look best, apply the eyeliner to the inner waterline of your eyes so that your eyes are totally bordered in black. This will not bother your eyes once applied unless you literally poke your eye with the eyeliner. But if you can’t do it don’t sweat it. Take your black eyeshadow and start covering your eyelids completely in a messy layer of black, use your finger to blend around the outer edges and under your eyes as well to make your eyes look sunken and ugly. 4. Continue to wipe black makeup messily down your neck, a little over your lips, and along your arms randomly. You don’t want to have perfect white skin if you’re trying to be dead. These details will benefit your overall creep factor. 5. So, I just want to mention that maybe some of you are thinking “I already have really long, dark hair so I don’t need a wig, right?” Real hair just doesn’t give the same creepy effect, it’s not as thick, it won’t tangle and stick as easily(which is what you want for this look), and it’s usually not as long as it really should be. I too have long, dark hair, but once I put on this black wig I transformed completely. Trust me, if you really want to pull off The Ring costume, please get the wig because it’s the most important feature you don’t want to cut corners on!! Plus, when you mess it up with tangling and hair products you don’t have to worry about ruining your actual hair. If you have long hair you want to part it down the middle, make two braids, wrap each braid around your head and hairpin them in place. This makes it so when you put your hairnet on, your scalp is as flat as possible and no hairs and sticking out from your wig. If this is your first time putting on a wig, I suggest watching a couple youtube tutorials just to make sure you get it right. That’s what I did. 6. Once you have your wig on, you want to make it tangled and frizzy. You have been dead in a well for years, your hair should look disgusting. Take small amounts of hair gel and rub it through your wig locks in random areas. This creates a messy, oily look. Since this character has been in a well, rubbing some gel through the ends of the hair can create a nice damp look. I also styled it so that I could just barely see through the parting of the wig. But you really don’t want to part it too much because it won’t look as creepy. Just enough to be able to not run into a wall. 7. Go get your well prop and fasten the interior harness so that it sits comfortably around your waist. (It should rest over the hips without sliding down.) Take some pieces of your wig and lay it out around the well prop. Wrap some pieces around your arms and fingers too, this makes you look even creepier if that’s possible. Be careful when passing by mirrors, you don’t want to spook yourself too much from The Ring costume!